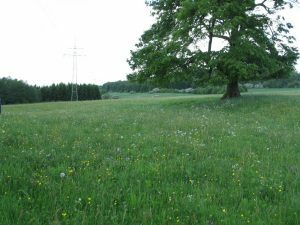 Area 1 is categorised as “Lowland hay meadow” (NATURA-Code 6510), although it tends to habitat type “Mountain hay meadow” (NATURA-Code 6520) because of several characteristic species. Up to now it was used for making hay and the second use was grazing by sheep. The area is located in the subdistrict Köddingen between Helpershain and Ulrichstein in the south-eastern Vogelsberg. The main plant species are Festuca rubra, Agrostis capillaris, Crepis biennis, Geranium sylvaticum and different subspecies of Alchemilla vulgaris.